Narces, which showed on Day 1 of Toronto Fashion Week, can be summed up with one phrase: more, more, more. The brand’s Austrian-born designer, Nikki Wirthensohn Yassemi, channeled the classic disco song with a multitude of flourishing details, including marabou feathers, lace panels and cake-like layers of tulle. The runway show kicked off with DJ Miss Tara taking the stage in an outfit worthy of a club kid superstar: a fishnet bodysuit encrusted with jewels and layers of black tulle taking flight off of her shoulders. The rest of the collection was also all about flaunting what you got. Imagine the glam Studio 54 goddess Bianca Jagger dancing a decadent night away in silver sequin trousers and a bell-sleeved, polka-dotted silver shirt. Yassemi, who lived in Iran and the UK before moving to Canada, brings an international flair to her designs. She might not have any formal fashion training, but you wouldn’t know that to look at her collection. Part of her unique perspective includes taking a classic motorcycle jacket and replacing the standard-issue leather with transparent organza. On the TFW runway, the Narces collection was filled with red carpet-worthy stunners and the occasional neck ruffle, reminiscent of an Elizabethan courtier. 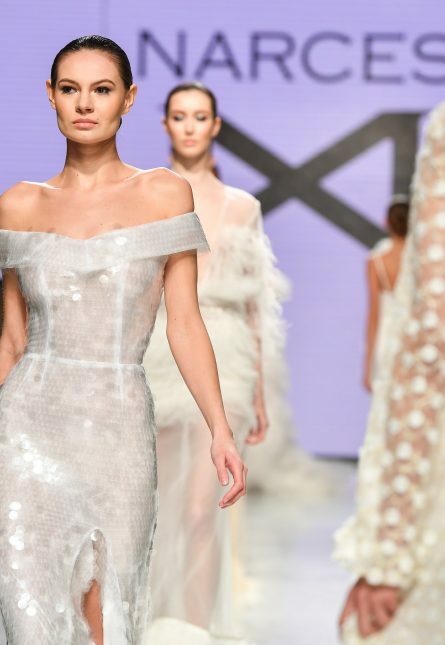 The show’s overall mood was fun and flirty, with DJ Miss Tara playing Madonna’s “Like A Virgin” for an added dose of cheek while bridal gowns paraded down the runway. Narces gowns have been worn by celebs like Game of Thrones’ Maisie Williams and Orphan Black’s Tatiana Maslany, and we predict Yassemi’s filmy, floaty gowns will be a top contender for the upcoming Oscar season.